Bark extract 500mg (5:1) - equivalent to 2500mg whole herb. Of all the herbs used by the ancient Incas, lapacho was one of the mainstays. Also called pau d'arco, ipe roxo or taheebo, lapacho is a rainforest medicine made from the inner bark of the large native South American tree known as tabebuia. Active constituents: Lapachol and beta-lapachone (known collectively as naphthaquinones) are two primary active compounds in lapacho. According to laboratory tests, both have antifungal properties as potent or more so than ketaconazole, a common antifungal drug. * Although these compounds also have anticancer properties, the effective dosage for this effect is toxic. Therefore, lapacho cannot currently be recommended as a treatment for cancer. Botanical names: Tabebuia impetiginosa, Tabebuia avellanedae. 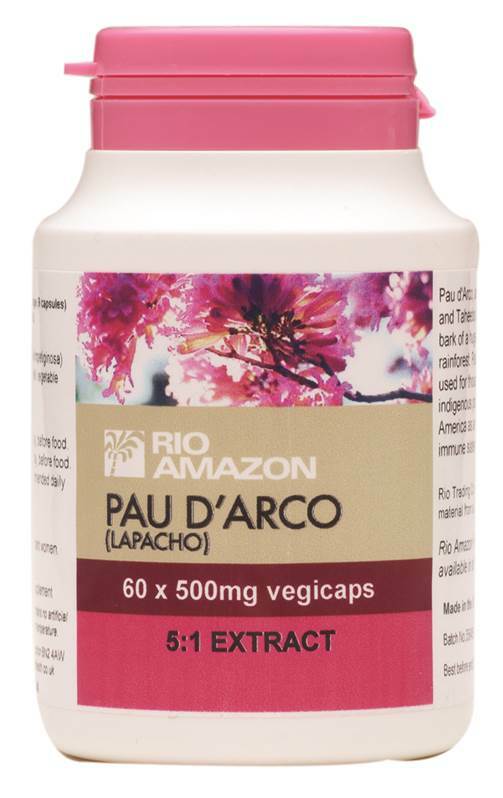 Pau d’Arco extract (Tabebuia impetiginosa) is derived from the bark of a giant hardwood tree that is native to the Amazon rainforest in South America. Also known as 'Purple Lapacho' - Pau d'Arco trees and bark infusions have been used by many rainforest tribes for over two thousand years to contribute to the immune system. Today it is still popular with the modern populations of Peru and Brazil.The bark contains many actives and is a souce of antioxidants. Rio Amazon Pau d'Arco vegicaps are prepared using only certified inner bark from the ‘cambium’ layer of these magnificent rainforest hardwoods. This process is entirely sustainable and the bark can be ‘harvested’ causing no permanent damage to the tree. Throughout South America, indigenous tribes have drunk tea made from the shredded inner bark to boost the effectiveness of the body's own immune defence mechanisms. They have also used this traditional remedy for centuries in the treatment of asthma, bronchitis, infections and some form of cancer. Rainforest Indians have always valued lapacho as a powerful medicine for strengthening immunity and to protect them against gut parasites. Caribbean folk healers use the leaf of this tree in addition to the bark for the treatment of backache, toothache, sexually transmitted diseases, and as an aphrodisiac. Ghandi took a cup of lapacho tea each morning throughout his life. The tea has an interesting flavour, part woody, part flowery, and is delicious hot or cold.